*We can assist with trans-Atlantic, international and domestic flights within the tour. We’ll spend six wonderful days in Cape Town beginning with a ferry ride to Robben Island. Learn about South Africa’s apartheid years at museums and explore her townships to learn of today’s opportunities, struggles and optimism. We’ll also enjoy wonderful natural areas, with visits to Cape Point, the Cape of Good Hope, Table Mountain, the fertile wine region and more, with lots of opportunities for wildlife viewing. Then, it’s off by our first internal flight (all of which we can arrange) to Johannesburg to see “Egoli” - the City of Gold and Soweto. From there we spend two days exploring by 4x4 vehicle the Kruger from our luxury suite accommodation at the Kampana Game Reserve. 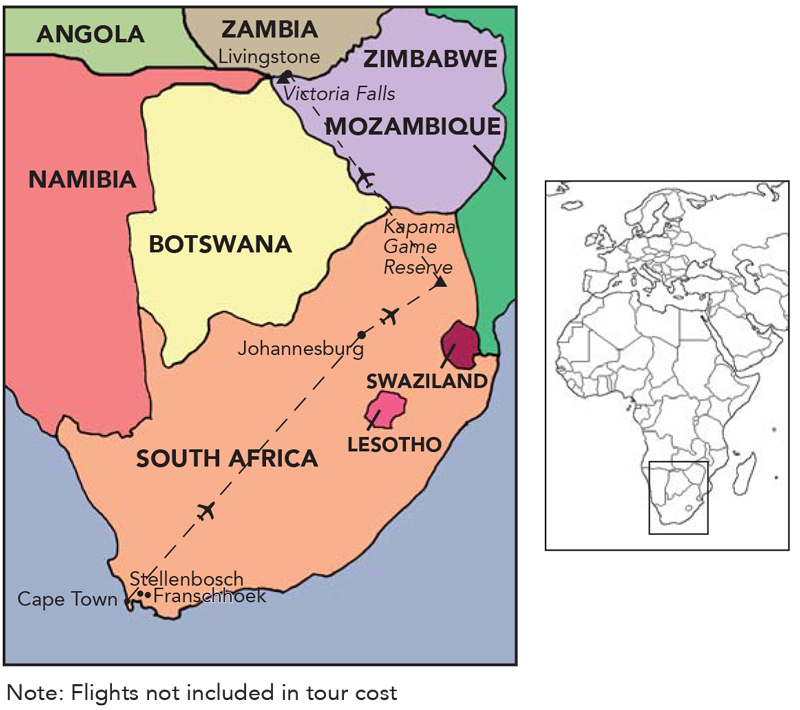 Then another short flight takes us to Livingstone, Zambia for three days of exciting scheduled activities including Victoria Falls, one of the seven wonders of the world! We’ve worked to arrange this very special trip just for you. Please enjoy our brochure and send your reservation form today. I look forward to personally welcoming you to our tour!